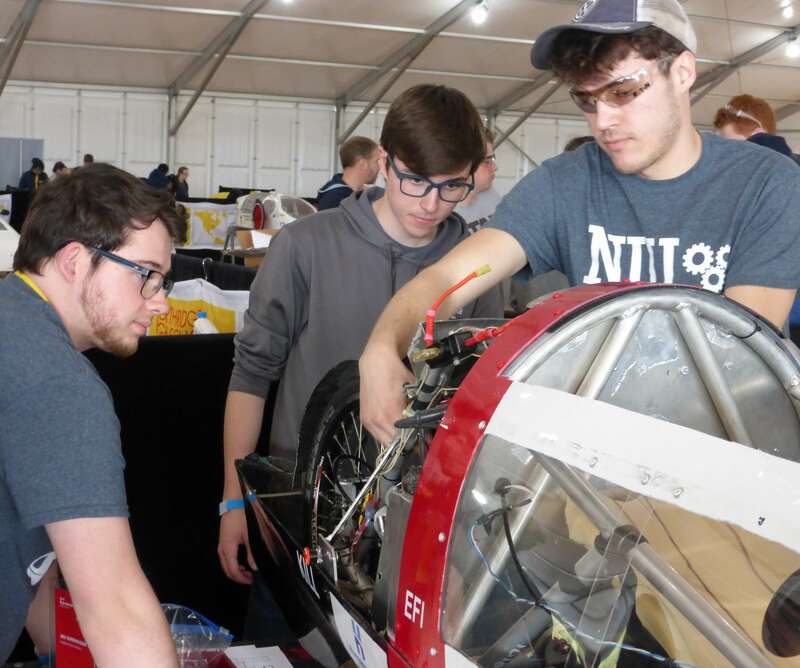 DeKalb, Ill. — The NIU Supermileage team has earned the “super” in its name. And then some. 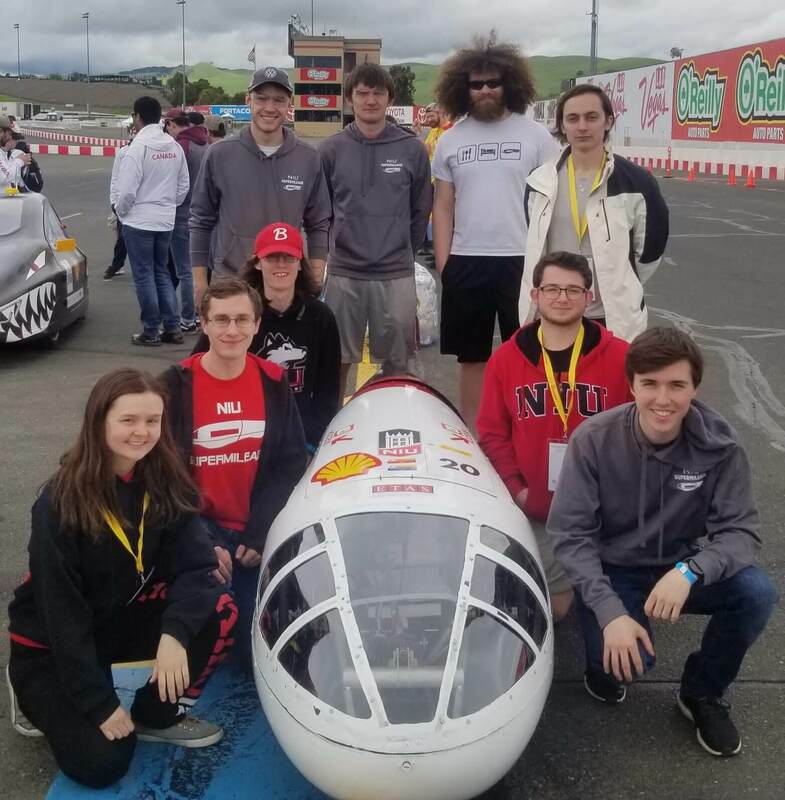 The team took top honors at a recent international competition in California when the gasoline-fueled vehicle it created achieved a whopping 1,525 miles per gallon. That’s nearly the distance from DeKalb to California—all on a single gallon of gas. 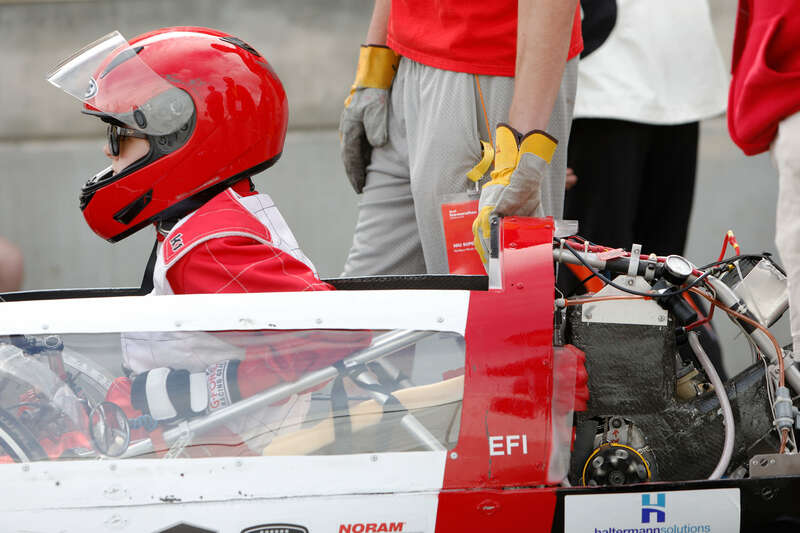 The team bested 27 competitors from throughout the world, including top teams from California Polytechnic University, Milwaukee School of Engineering, University Laval of Quebec, Brigham Young University and the University of British Columbia, at the 13th annual Shell Eco-Marathon Americas. The competition took place April 3-6 at Sonoma Raceway. “We’re not only a team, we’re a lot like a family,” said Lauren Bangert (left), the driver of the NIU Supermileage Team’s vehicle. The Shell competition pits teams of students from throughout the world against one another. The students design, build and drive single-occupant, ultra-fuel-efficient vehicles in an effort to create the most energy-efficient car. It takes talent, time and ingenuity to hand-build the Huskie Rocket. Team members work from the ground up, starting with in-house designing all the way to machining and fine-tuning. “These students really epitomize the capabilities and high quality of our students in engineering. 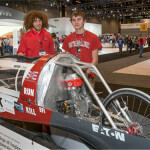 They are extremely dedicated,” said Dean Donald Peterson of the NIU College of Engineering and Engineering Technology. 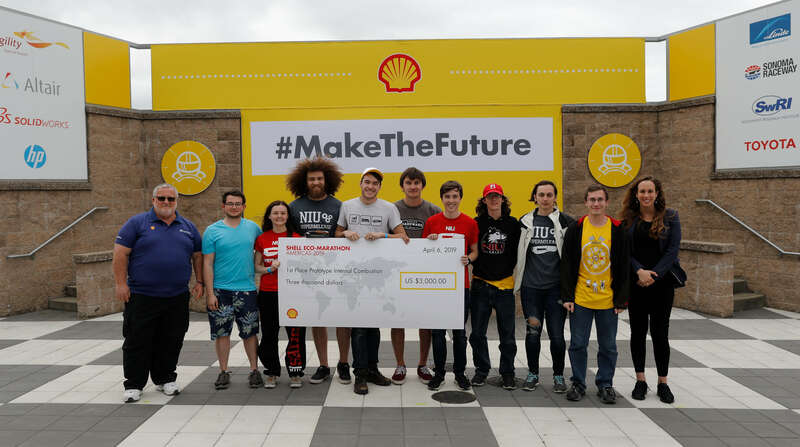 In its eighth year at the Shell competition, the team already had a reputation as a successful team, but the championship took members by surprise. “I really put my heart and soul into the team,” NIU Supermileage team president Josh Helsper (right) said. He and his teammates continually make updates to keep the vehicle competitive. You could say the team’s on a roll. 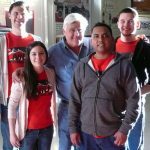 In 2016, the Rocket and several of the team’s members were featured in a Shell commercial with Jay Leno to promote the Eco-marathon. And this past summer, the team won second overall with its best-ever combined score, as well as the Endurance Award for the second year in a row and the fuel mileage prediction award, at the Society of Automotive Engineers Supermileage Competition in Marshall, Mich. 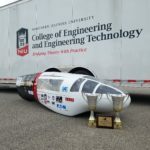 The NIU vehicle recorded an astounding 1,888 miles per gallon—a team record—at that competition. The team will return to Michigan, where it has placed in the top three nearly every year, again this summer. Unlike the Michigan track, the Sonoma Raceway track had sharp turns, Helsper said, and traffic congestion as drivers competed at once. Bangert called the win a team effort and shifted the credit to the vehicle’s design and team leaders, including vice-president Matt McCoy, a sophomore mechanical engineering student from Downers Grove. With about 12 active members, the NIU team has worked with the same core vehicle design since its beginning. Each year, members make important updates to keep the vehicle competitive and to push the limits of engineering. “I would argue our car is one of the most reliable at any competition we attend,” Helsper said. “We’re really good at working on the fly, fixing things that hadn’t really gone to plan. There was a good amount of that at this competition,” he said of the California event. Graduating this spring with a mechanical engineering degree, Helsper, of St. Charles, intends to continue on at NIU and obtain a master’s degree in mechanical engineering. The NIU Supermileage team has been a highlight of his time here. “I really put my heart and soul into the team,” he said. Northern Illinois University is a student-centered, nationally recognized public research university, with expertise that benefits its region and spans the globe in a wide variety of fields, including the sciences, humanities, arts, business, engineering, education, health and law. Through its main campus in DeKalb, Illinois, and education centers for students and working professionals in Chicago, Hoffman Estates, Naperville, Oregon and Rockford, NIU offers more than 100 areas of study while serving a diverse and international student body.